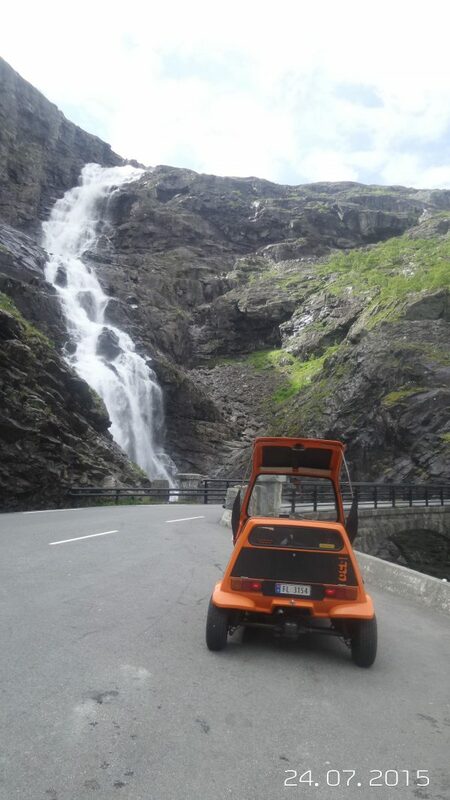 Our Bond Bug was imported to Norway from Grimsby, UK , around 2005 and was used as eyecatcher in a shop for about 10 years. The owner asked me if I wanted to buy it, (he wanted it to come to a good home I guess) , and since the price was very good ,we buyed it. 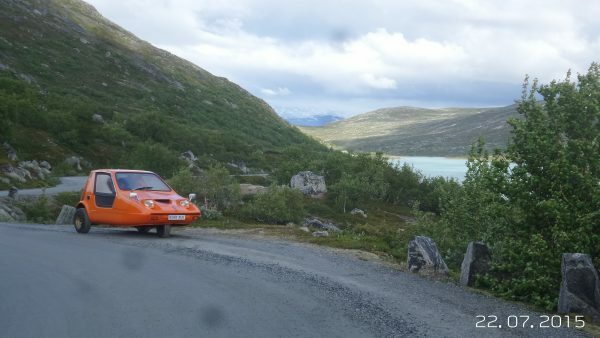 Had a lot of trouble to get it registered in Norway, becuse all the papers on the car was gone, But with a lot of helf from the Customs we could get it on the road. This car is so fun to drive, ugly or not, fun,fun,fun. 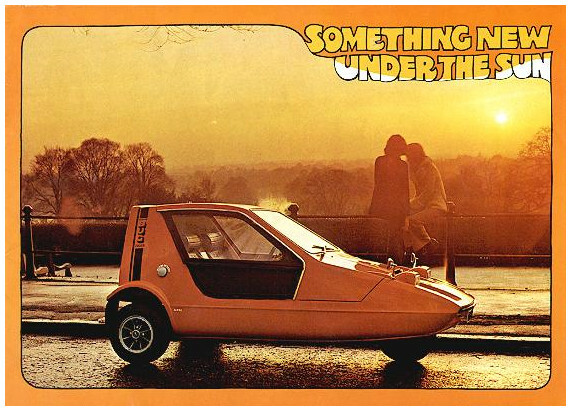 The Bond Bug is a small British two-seat, three-wheeled automobile which was built from 1970 to 1974, initially by Bond Cars Ltd and subsequently by the Reliant Motor Company. 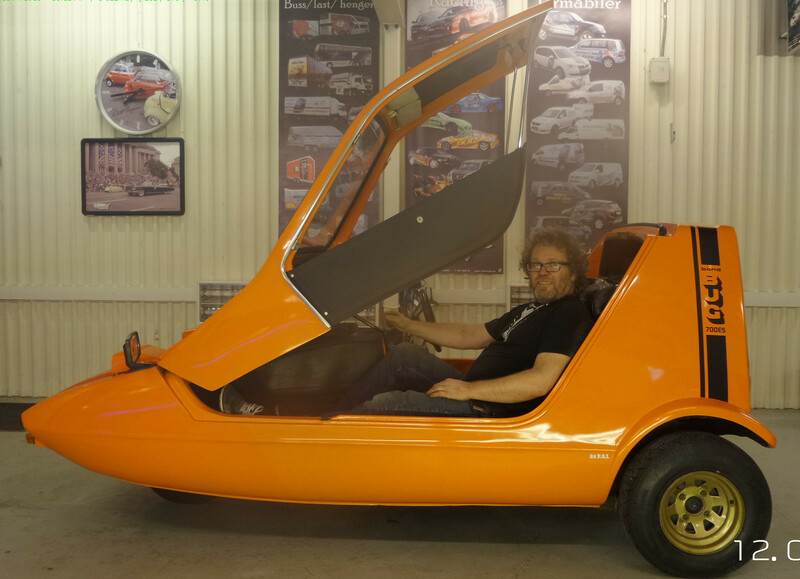 It is a wedge-shaped microcar, with a lift-up canopy and side screens instead of conventional doors. 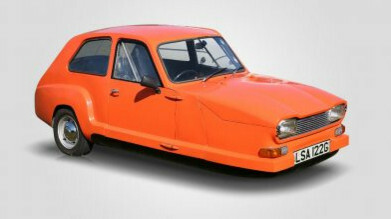 Following the purchase of Bond Cars Ltd., Reliant commissioned Tom Karen of Ogle Design to design a fun car. 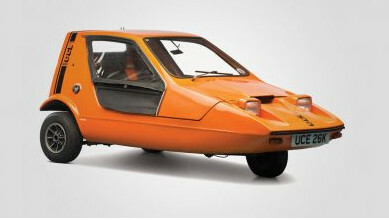 The Bond Bug was based on Chief Engineer John Crosthwaite’s newly designed chassis and some Reliant Regal running gear. The original concept was explored by chopping down a production Regal vehicle, the rear of the car being shortened to end over the rear axle. This prototype could be seen for many years later, languishing in the yard at the rear of the factory, by anyone who cared to look through the chain-link fence from the canal towpath. After the war there was a great demand for powered transport coupled with shortages of fuel and raw materials such as steel. 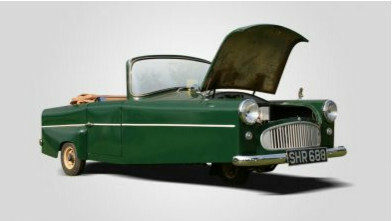 Lawrie Bond designed a small three wheeled car and took his design to Sharps Commercials who agreed to manufacture it and the first Bond Minicar was born in 1947. The starting advertising campaign was very aggressive: the 3-wheelers passed several endurance races and showed fuel consumption of 100 mpg. Full scale production started in early 1949 at Sharp’s Ribbleton Lane in Preston. The company produced only 15 Bond Minicars per week in the beginning. 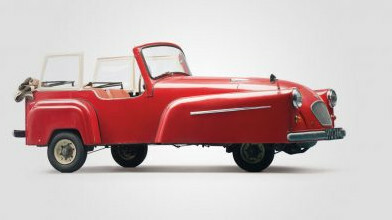 The Bond Minicar Mark A as it was later to become known had two seat, open topped bodywork made largely of aluminium. There were no doors, in order to retain the shell’s rigidity, but simply a slight curved cut-out to the cockpit side. The single front wheel was driven by a 122cc Villiers MK10D two stroke engine mounted on the front suspension so that it turned with the steering. Only the rear wheels were braked, there was no rear springing, and the single windscreen wiper was operated by hand. The new car proved to be light, economical, and able. Further development resulted in the Mark B which externally resembled the Mark A. Improvements were made to the steering, and rear suspension was added. As the Minicar gained popularity, more owners seemed intent on emulating the long distance endurance runs, which had been a feature of the early publicity for the Minicar. This together with an overall trend for owners to use their vehicles for substantially more than the local travelling that had been at first envisaged, had led to the introduction of a “De-Luxe” model in 1950, powered by a 197cc Villiers Mk6E engine. 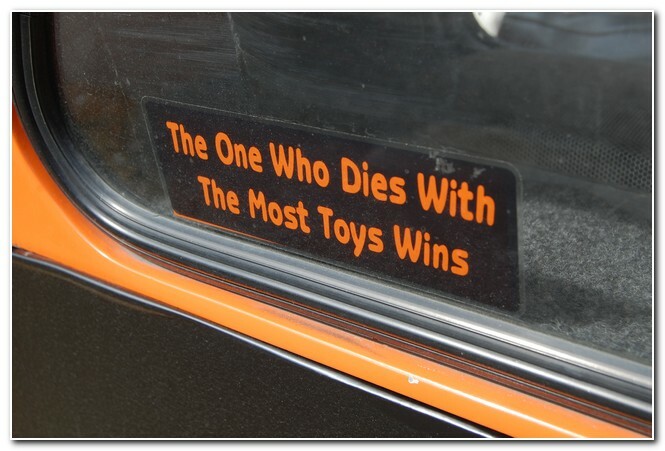 Popularity of Bond Minicars was growing up. The deman for a slightly more practical version led to the introduction of the Mk B model in July of 1951. 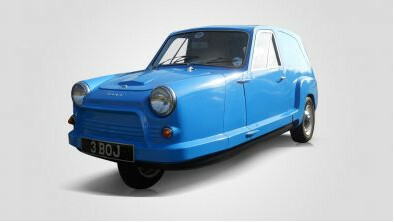 The Bond Minicar Mk B got a more powerful 197 cc engine as standard. The new version also got a Triplex windshield with a new stronger frame and newly designed hood. Exterior design of Mk B was similar to Mk A. 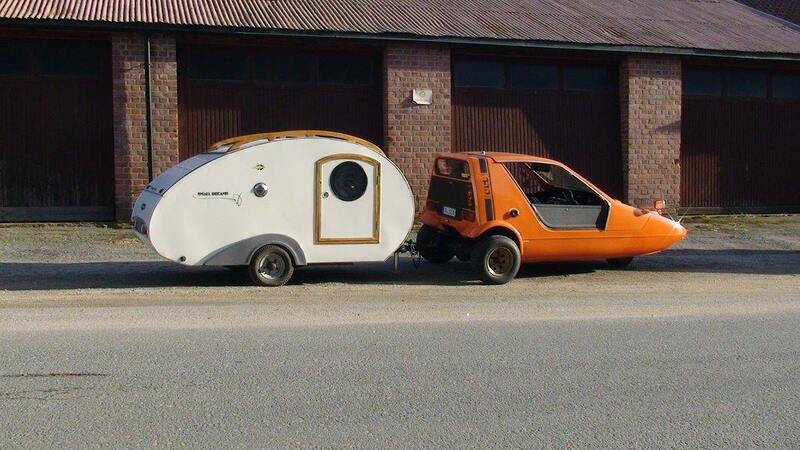 It also used the same aluminium body without roof, but had an additional luggage space in the rear. The rear mudguards become smaller, but wider to accomodate the wheel movement. The main techincal improvement was a simple coil-spring rear suspension system, designed by Granville Bradshaw. It was of the sliding pillar type, a block carrying the stub axle rode up and down on two guide pillars mounted on a solid casting bolted to the side of the body. As you know, the Mk A doesn’t have the rear suspension at all. The front suspension got hydraulic shock absorbers. Other features – more efficient brakes, improved electric and re-designed split rim wheels to aid tyre changing. The larger engine and extra weight of all the improvements increased fuel consumption level up to 76.8 mpg. 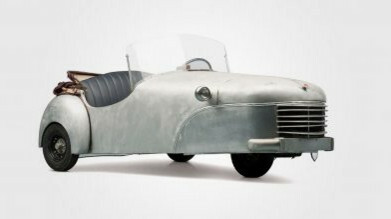 October 1952, Bond introduced the 3rd generation of its 3-wheeler – Bond Minicar Mk C. It can be easily distinquished by a revised front end with headlights integrated in the front wings. It also was equipped with a Villiers 6E 197cc engine and a 3 speed direct change gearbox. The new front suspension allows 180° steering, lock. (instead of 90°), thanx to a new worm and sector steering arrangement. ‘U’ turns could be acheived in about 10 or 11 feet making a reverse gear almost unecessary, although some cars had the option to start the engine backwards to provide reverse motion. The single side door became a standard fixture on the Mark C.
The engine, again a Villiers unit, continued to be mounted as part of the front suspension and steering. The rear suspension was by “six-hole” Flexitor bonded rubber units produced by George Spencer Moulton & Co. Ltd. and the brakes operated on all three wheels (finally!). 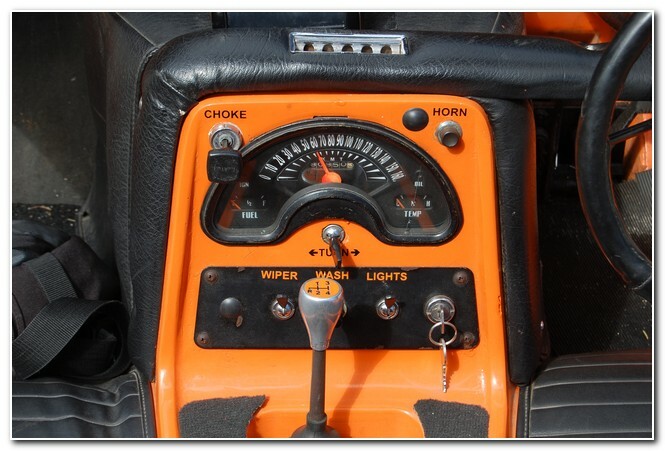 The horn, wiper motor and lights are still used 6 volts electric. Starting was by means of a floor-mounted handle and cable to a modified kickstart lever. Deluxe version received an electric starter (but the floor-mounted handle was retained – just in case!). In June 1953, the company introduced Villiers 8E 197cc engines and a chain adjuster. 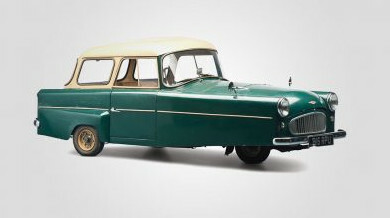 Initially Bond Minicar Mark C was available in two versions: the Standard Tourer or the Deluxe Tourer with a single bench seat, electric starter and rear bumper. Several improvements were announced for 1954. First of of this is a new shape Triplex windshield and frame. There were also some changes in steering, transmission and dashboard. The rear wings were made of steel from this moment when supplies of aluminium became difficult to obtain. Since 1955, bonnets and rear wings were now being made from glass fibre. There were also some modifications of the brake system and silencer. 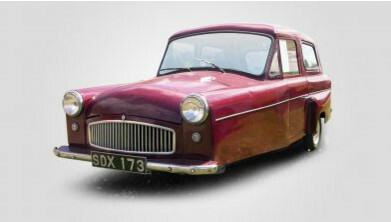 Another major update of Bond Minicar Mk C was made in 1956, when all vehicles got a new ‘Type II’ front grille and bonnet and the windscreen rubber was fitted with a new cream filler strip on the outside. Announced on 31 October 1956 as a late addition to the 1957 range, the Bond Minicar Mark E received a completely new body with 2 doors and a new chassis made of steel box secions. 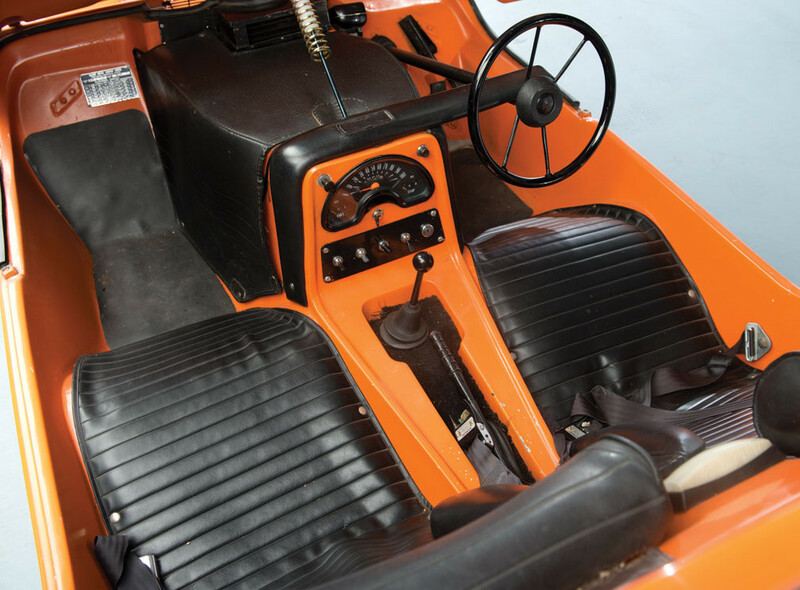 The Villiers 9E, 197cc engine and 4-speed gearbox were the same, as used in the late Mark D minicars. Siba Dynastart became standard equipment. The new generation also had a wrap around Triplex windshield, sliding side windows and full width front and rear chrome bumpers. The wider front grill was bolted either side to the front wings. The body was completely flat-sided and as with previous models used light alloy for all exterior panels. The range was increased by using a larger 3¼ gallon petrol tank. Mark E had 12 v electric system and included such options as two windshield wipers, front and rear turning signals, 7 “head lamps and rear / brake lights. The dashboard was made of fibre glass. Its instrument panel included a large speedometer, ignition warning light, choke control, windscreen wiper switch and a three-way key operated switch for ignition, starting and, when fitted, reverse. Both seats were adjustable and folding allowed access to the rear luggage compartment. The passenger seat could be removed completely to increase baggage capacity. Overall dimensions: length -11 ‘0 “, width – 5’ 0”, height – 4 ‘0 “, wheelbase – 5’ 6”. Weight – 672 lb. The last vehicle designated as a Mark E was a Light Green Saloon Coupe, tested on 6th November 1958. 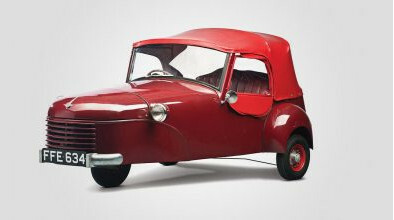 Bond Minicar Mark F was presented at the November 1958 London Motorcycle show. The body of Mark F was identical with the previous Mark E, but the new generation of 3-wheeler got a new Villiers 31A, 250cc engine with a 4 speed positive stop gearbox and a Siba Dynastart. Although, reverse was still an option. The engine had 247 cc and boasted 12 bhp (9 kW; 12 PS) at 4,500 rpm (an increase of 3.6 bhp (3 kW; 4 PS)). The best moment, that the fuel consumption was the same – 4.7 L/100 km! Top speed – 55 miles (89 kph). Three versions were available from the beginning: Mark F Tourer, the Mark F Saloon Coupe and the Mark F 4-Seater Family Saloon. Dimensions and weight (672 lb) remained unchanged. Available colors are also the same: Scarlet, British Racing Green and Light Green. 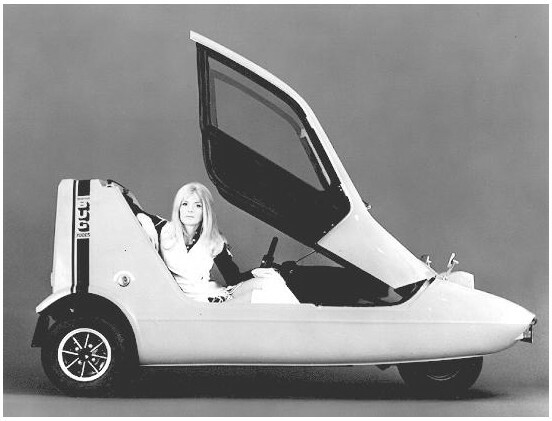 Bond Minicar Mark F was extremely successful. The company produced almost 100 cars per week. The Mark G was the last generation of Bond Minicars. It used style and a large extent on the bodyshell of the Mark F. But there were some major differences. For example, a revised shape fibreglass roof, new doors, new windshield with opening quarter lights and bigger 10″ wheels. Despite the fact, that Mark G and Mark F looks similar, almost everything mechanically about the Mark G was different with very few components carried over. Villers specially designed a new engine Villiers Mk 35A with a capacity of 250 cc. They improve strength and reliability, as well as increased otput to 11.5 bhp (9 kW; 12 PS) at 4,500 rpm. It works with 4-speed positive stop gearbox and a Siba Dynastart. Rear suspension was completely revised and got new parts. Safety level was increased with a new Lockheed semi hydraulic and rod braking system (front brake fully hydraulic, but rear brakes still rod operated from a central floor-mounted hydraulic cylinder) acting on all three wheels. The new windshield increased interior volume. Thanks to this, two adults can sit on a bench-type rear seat in Mark G. Controls were similar to Mark F. Early vehicles used aluminium rear wings with glass fibre fin inserts. Although public reaction at the 1962 Motorcycle show remained encouraging, the changes to purchase tax meant there was now a much less significant price difference between the Minicar and other small cars and in November production was scaled back with consequential job losses. 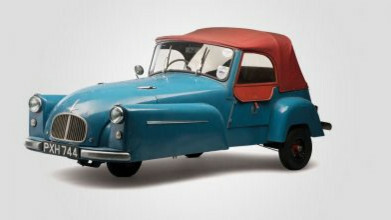 The same month Villers developed a new engine 4T (250 cc, 14.6 bhp (11 kW; 15 PS) at 5,500 rpm) for Bond Minicars, which increased top speed to 60 mph (97 kph). 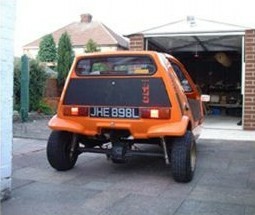 Bond 875 was a successor of Bond Minicars and produced since 1966 to 1970. It was partly developed by Lawrence Bond and manufactured by Bond Cars Ltd in Preston, United Kingdom. The car was announced in August 1965. Production started only the year later, in the summer 1966. The new 3-wheeler got 875 cc 4-cylinder 4-stroke 34 b.h.p. engine. The same was used in Commer Imp Van. This was rear-mounted, unlike in most other British three-wheelers of the era. The water-cooled engine behind the transaxle drove the rear wheels. It also was fitted with a 4-speed and reverse gearbox, and independen suspension on all wheels. 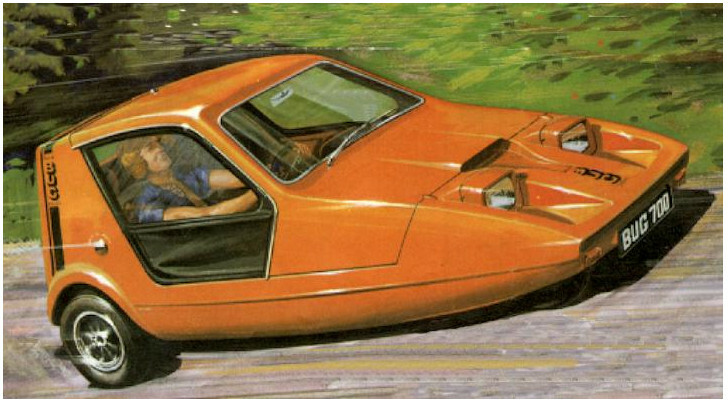 Bond 875 weighed less than 400 kg (82 lb), thanks to fibreglass body with aluminium doors. Tires were 12″ x 5½”. Top speed: 80 mph (129 km/h). 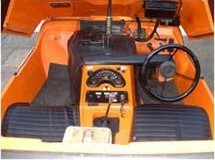 The standard Imp instrument binnacle was mounted directly onto the glass fibre dash. The Bond 875 Mark II was introduced in 1968. Production versions didn’t have front bumpers. A bonnet and engine cover were made of glass fibre. Non-opening rear side windows in Perspex were used. Steering problems had also been overcome with the introduction of the fully floating front brake back plate. Price £410 plus £86 19s 7d purchase tax making a total of £496 19s 7d. (£496.98p). 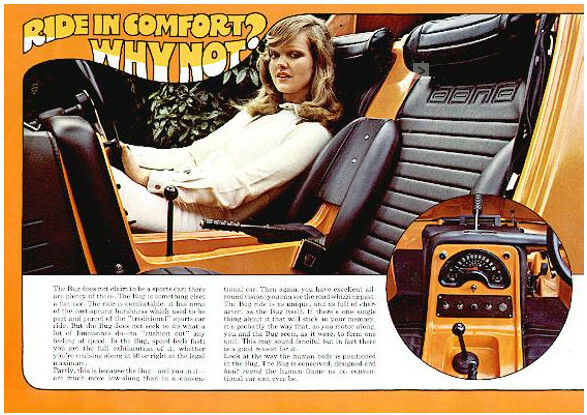 April 1967, the commercial version Bond 875 Ranger was introduced. It based the Saloon version and had a lift up tailgate, no rear side windows and single drivers seat in the front. Its iternal capacity is 40 cu. ft. A single wing mirror was fitted – by law – to the right hand front wing. The spare wheel, heater/demister and the passenger’s seat could be ordered as an option. Price (with no purchase tax payable on commercial vehicles) was £417 10s 0d (£417.50p) in primer or for another £10 the body could be painted! In March 1968, the Bond 875 was given a facelift with a new front and other minor improvements. The Mk II version of the 875 featured a restyled front, the rear remained unchanged. The front grill is identical to that used on the 2 litre Equipe. The restyled front got a larger opening bonnet, rectangular headlamps, combined sidelights/flashers and a front grille concealing the heater air intake. Windscreen washers and a heater became standard equipment. Mechanically the Mark II was identical to Mark I. 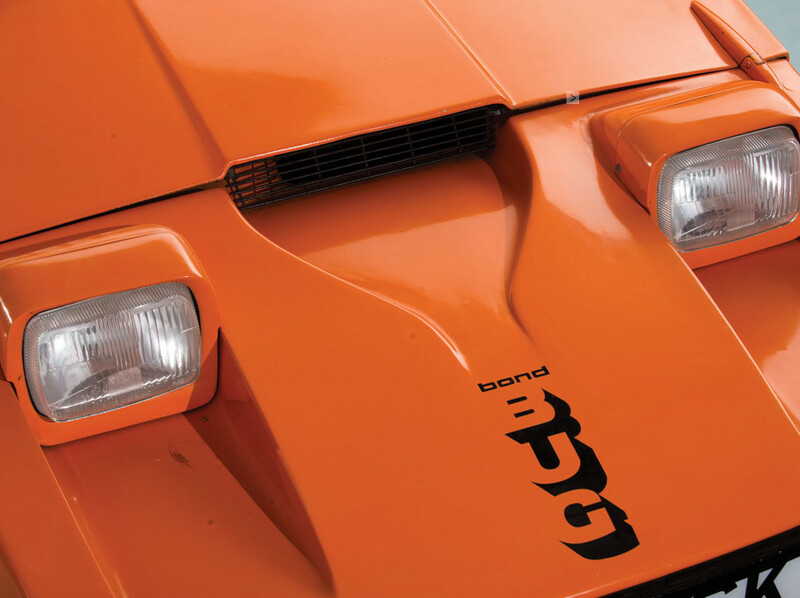 Totally 1,403 3-wheelers Bond 875 Mark II were produced. Price £449 10s 0d + £126 18s 1ld purchase tax making £576 8s 1ld (£576.44p). The last Bond 875 Mark II was produced in February 1970. Bond 875 Ranger produced until 1970 with the Mark I design. 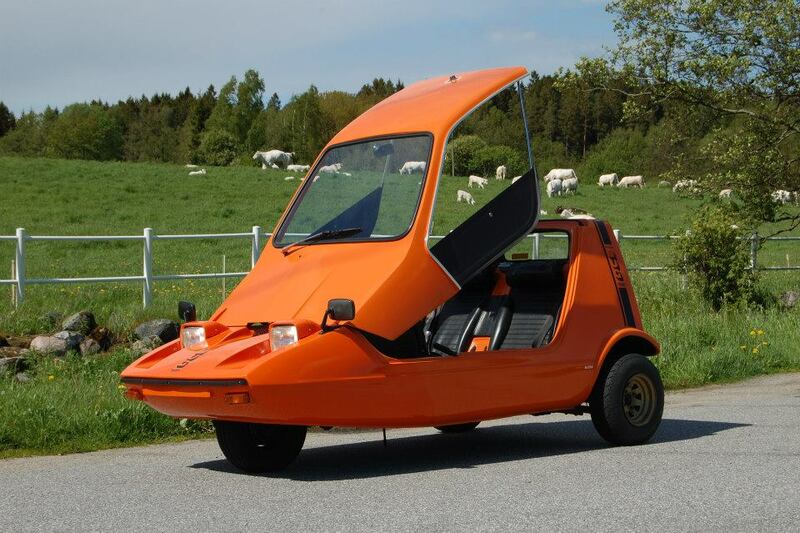 Production of Bond Bug 3-wheeler started in February 1970. The first 17 vehicles were all to 700E specification. The year before, in February 1969, the company was taken over by the Reliant Motor Co Ltd. 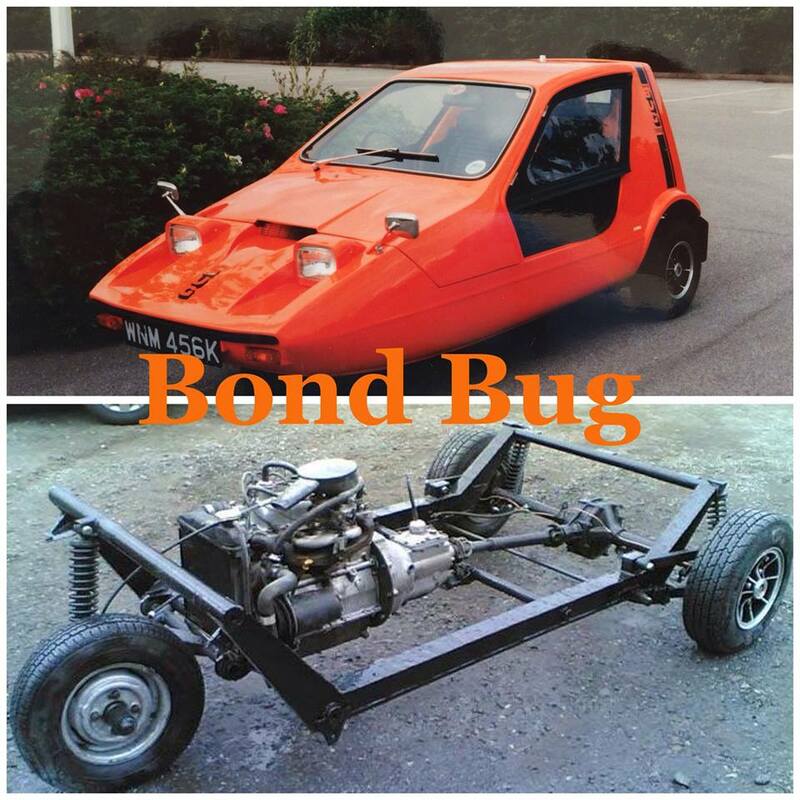 The new owner continued to use Bond brand name till the end of production of the Bond Bug in 1974. 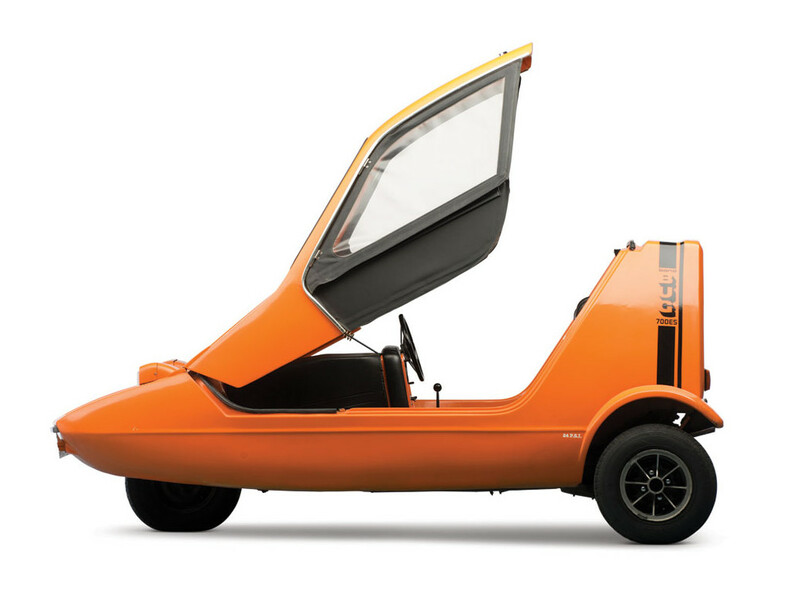 Bond Bug features a distinctive, wedge-shaped two-seater fibre glass body. A lift up canopy opens access to passenger compartment. A box section chassis was used as the base. The 700 cc Reliant engine, forward mounted, drove the rear wheels through a 4 speed/reverse gearbox. At launch 29 bhp (22 kW; 29 PS) was claimed for the less expensive 700 and 700E models. Length 9′ 2″, width 4′ 7″ and height 4′ 2″. Colours available: Tangerine with Black interior trim. 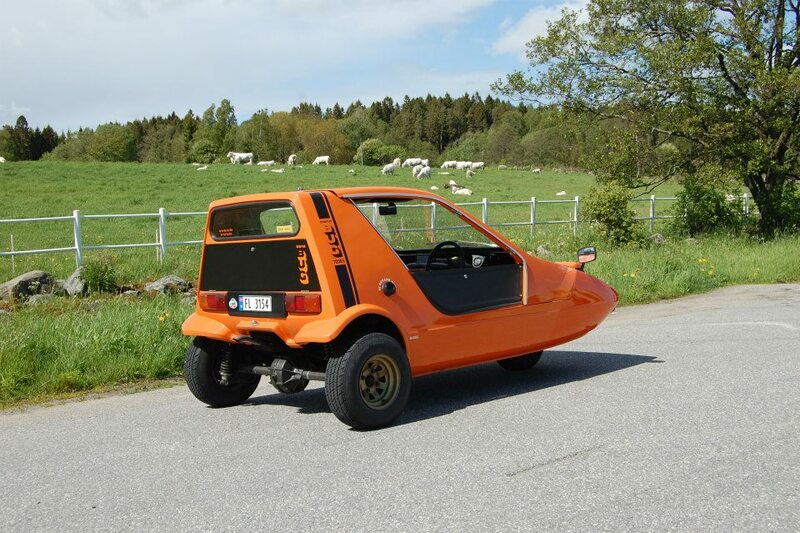 The Bond Bug 700 was chosen as a base model. It was intended that it should be sold without any sort of refinements or luxuries. But only one example is known to have been built. Launch price including purchase tax was £548 0s 4d (£548.02p). 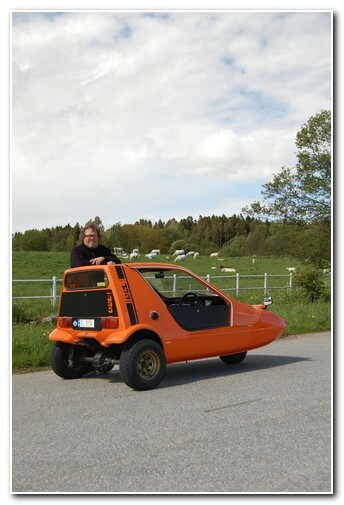 Bond Bug 700E became much more popular. It was fitted with sidescreens, a heater, a telescopic canopy damper, canopy lock, polished hub caps, chrome glazing rubber trim, drivers sun visor and even an interior light. Price £579 7s 0d (£579.35p). Bond Bug 700ES was another version, similar to 700E but equipped with a higher compression engine (it was increased from 7.35:1 to 8.4:1). This gives two additional horsepowers (23 kW, 31 hp). It also got Decathlon low profile tyres, spare wheel, rubber front bumper, wing mirrors, mud flaps and several other “extra’s” such as headrests, side and centre seat supports, twin horns, “Formula 1” steering wheel, etc. Price £628 19s 2d (£628.96p). October 1973, the Bug 750E and 750ES were introduced. Similar to the 700E and 700ES but with the larger capacity 750 cc engine. Price was £648.87p and £694.14p respectively. 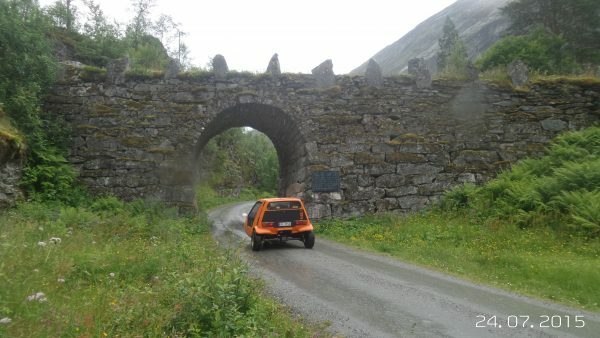 The Bug offered very good performance and attracted a lot of attention, but it, being based on the Reliant chassis layout, never acheived the level of stability offered by the genuine Bond products. Although it was quick, it still was no much for the performance of the 875.